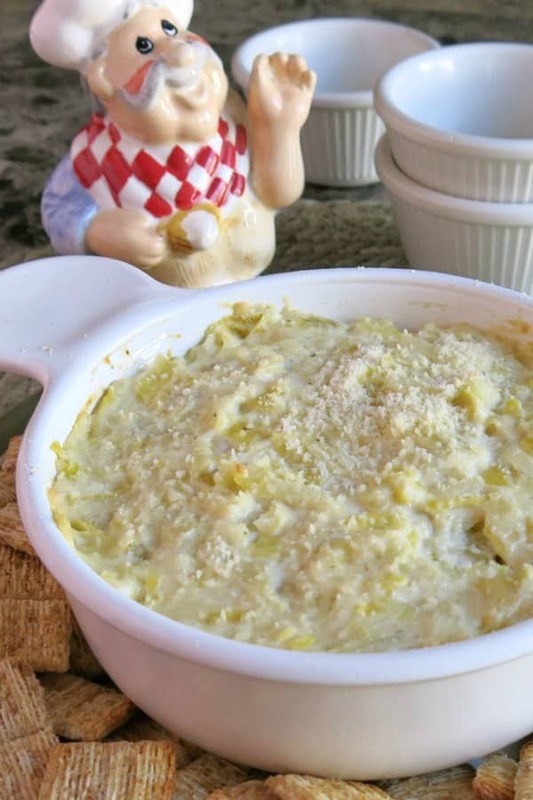 This Warm Artichoke Dip recipe with cream cheese, Parmesan cheese and mozzarella cheese can also be served hot or cold or any temperature in between…making it the perfect party dip! It’s ALWAYS a crowd pleaser. It’s low-carb, gluten-free and can be indulgent all at the same time. It all depends upon what type of dipper you use. Serve it with crackers and a plate of vegetables including carrots, celery sticks and everyone will be happy. Keto dieters may like to pile it on top of Parmesan Crisps. Feeling fancy? Check out Hot Crab and Artichoke Dip which is perfect for seafood lovers. Artichokes are the star of this recipe. Drain them thoroughly and roughly chop them. I started with quartered pieces. Make sure to buy artichokes that are NOT marinated or you will get an entirely different outcome that will incorporate the taste of the marinade. 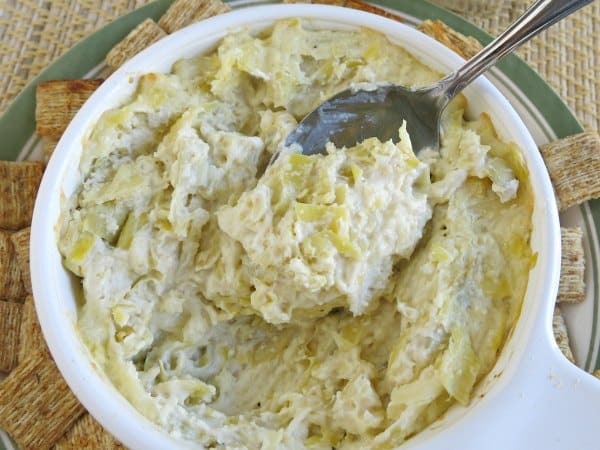 I’ve only used canned artichokes to make this, but check out this Fresh Artichoke Dip recipe if you want to go that route! Over the years, we’ve used products that are low-fat, fat-free, dairy-free and full fat. I’m not judgey…use the products that you use for everything else! Everything goes into a bowl and is mixed thoroughly. Scrape the mixture into an oven-proof dish and bake in a 350 degree oven for about 15 minutes or until warmed through and bubbly. Use ramekins for instant portion control! 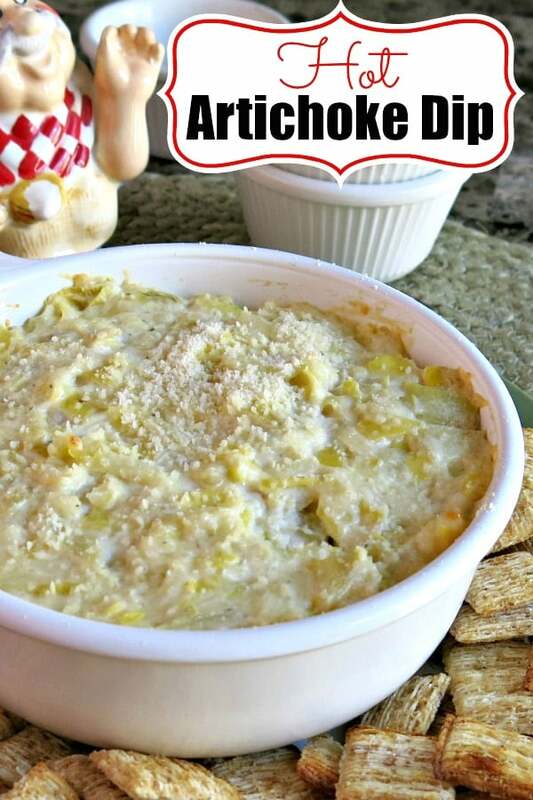 If you’re having Warm Artichoke Dip for a party, then make it up ahead of time. Prepare the recipe up to the point of cooking it. Cover and refrigerate until ready to enjoy! It will stay fresh in the refrigerator for several days. Can you Freeze Warm Artichoke Dip? Yes! Wait until the artichoke dip has cooled if you are freezing leftover dip. You can also assemble and freeze this recipe before cooking it. Assemble it in the container that will go in the freezer. Cover with plastic wrap and then aluminum foil and freeze. For the best results, use within 2 months. When you are ready to enjoy the artichoke dip, defrost it in the refrigerator overnight. It can also be cooked from frozen. Use a meat thermometer to ensure it reaches an internal temperature of 145 degrees Fahrenheit. Stuff or top chicken breast with it. 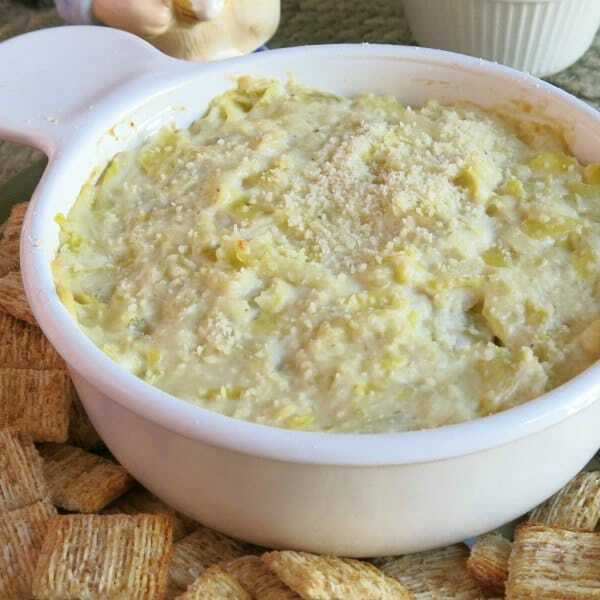 Warm artichoke dip is rich and creamy with three cheeses. 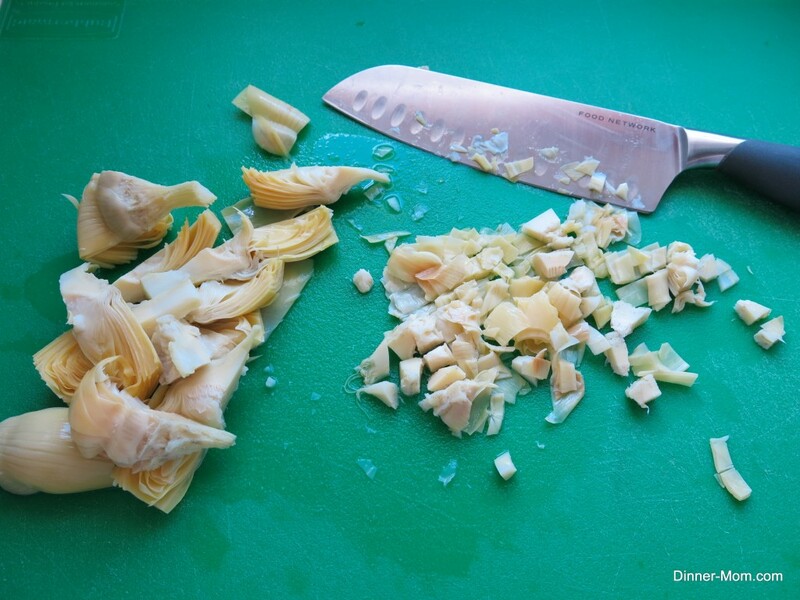 Drain and roughly chop artichoke hearts. Thoroughly mix the ingredients together in a bowl with a spoon. Scrape mixture into a shallow oven-proof dish. Sprinkle additional Parmesan cheese over the top if desired. Bake uncovered for 15 minutes or until warm and bubbly. Will make this forvOscar party…thanks! I hope she likes it. 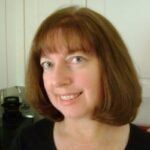 I’ll be thinking about low-carb recipes for her! I love artichoke dip, but was never really adventurous enough to include it in other things – I’m typically just a dipper! 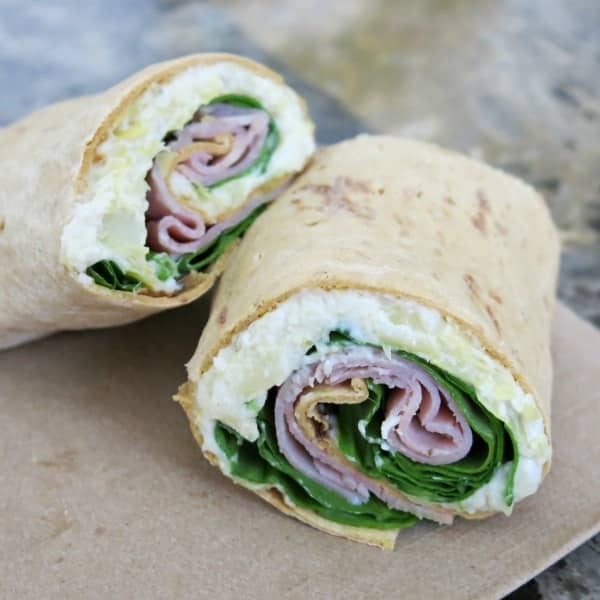 I tried it on a wrap for lunch today and it was so good! Thanks for sharing! Made this dip last night and it was a huge success even when it was cold. Nice recipe!